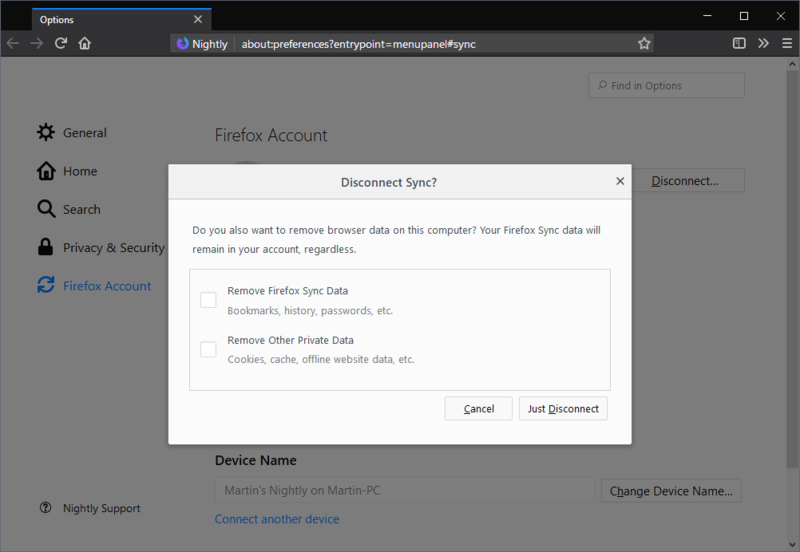 Mozilla plans to roll out an improvement to the Firefox browser's Sync functionality; Firefox users will receive a prompt when they disconnect the browser profile from Firefox Sync that provides them with options to delete local sync data. When you disconnect Firefox Sync on a device, nothing happens remotely or locally immediately. Firefox won't delete any local data that may have been synced with the device and remote data is not touched either. Remove Firefox Sync Data -- this removes bookmarks, passwords, the browsing history and other data that is supported by Firefox Sync. Remove Other Private Data -- this removes data such as cookies, the web cache, or offline website data. You can check one, both, or none of the options. If you don't want any data to be removed hit the "just disconnect" button without checking any of the boxes displayed to you. Mozilla revealed on the official bug listing on Bugzilla@Mozilla that "many users believe that their data will delete from the browser" when they disconnect Firefox Sync. The new prompt gives users the option to remove the data should they want to do so. Firefox users who want to delete remote data only can't do that easily, however. Probably the easiest option to remove synced data on Mozilla servers is to delete the entire Firefox account. I welcome the direction of Firefox. Currently, I use Quantum (which implements Beta, Developer-Edition) and Vivaldi (Stable channel, 64-bit) together, but SeaMonkey, Brave and Iridium are also implemented as other sub. Because you are using iPad, you need a synchronization function. However, since the synchronization function of the device has uncertainty about risk such as unexpected data loss and privacy leakage, I can not trust it. Therefore, I use “cloud storage service” SpiderOak “and” Box “. Doesn’t Chrome do this already? Otherwise I’d certainly appreciate this new Firefox 62+ ‘clear local sync data prompt on disconnect’ announced feature. Sync is a great feature. I use it to sync everything, so all my PCs are the same. I always did wonder what happens to the data when you uninstall/disconnect FF/sync. I would always delete the entire profile folder from my PC when moving to a new PC just to be sure, but this is a great way to clean it all up. Well, what about the many users that believe their data will delete from the PC when they uninstall the browser ? Anyone remember when Firefox would ask you if you wanted to uninstall just the browser or the browser AND the data ?